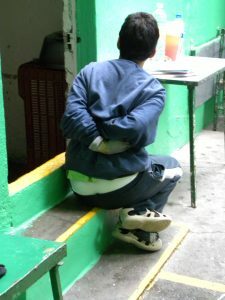 A boy at Casa Esperanza with his hands bound behind his back. Photo credit Eugene Richards. Washington DC, Mexico City, – January 18, 2017 – Disability Rights International (DRI) and the O’Neill Institute for National and Global Health Law filed a case today with the Inter-American Commission on Human Rights (IACHR) for the egregious human rights violations against 37 persons with disabilities who were detained at the ‘Casa Esperanza’ institution in Mexico City, Mexico. Modeled on the US Supreme Court Case of Olmstead v. LC, the case seeks recognition under international law that all people with disabilities have right to live in the community. DRI investigations revealed that adults and children with disabilities were detained under dangerous, violent, degrading and unhealthy conditions. The victims suffered physical and sexual systematic abuses, forced sterilization, and they experienced the use of restraints and isolation rooms for long periods of time, constituting cruel, inhuman and degrading treatment, including torture. Mexico closed down the abusive Casa Esperanza facility after DRI exposure, but it transferred survivors to other locked institutions. Two have since died. This case seeks reparations for torture – as well a right to safe and decent housing and mental health services in the community. “Survivors of Casa Esperanza committed no crime, yet they are serving a life sentence in Mexico’s institutions. We are not just seeking cleaner institutions, we are demanding that people have a chance to live a life in the community, with family and friends, just like everyone else,” stated Eric Rosenthal, Executive Director of Disability Rights International.